Description: EBT. Here is an original photo that I took of an East Broad Top Railroad motorized vehicle near Orbisonia, Pennsylvania, on 18 August 1960. 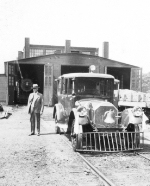 Shown here is a partial view of EBT Railbus #M-3, a slightly-modified 1928 Nash automobile.